Discovering.Me. 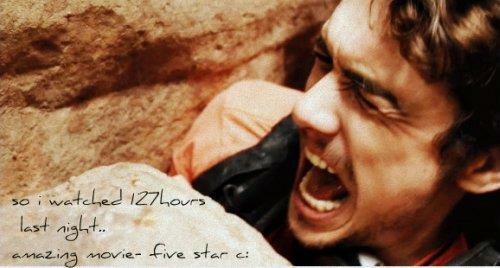 : Movie Review- 127 Hours starring James Franco. 127 hours is about a man named Aron who is exploring the Grand Canyons, and finds himself in a very bad situation.He falls down one of the caverns and finds his wrist and hand are wedged between a rock (boulder more like) and the rocky wall. He has his video camera with him and makes lots of videos talking to his mum and dad etc because he thinks hes going to die. He slowly loses his mind over 5 days and then on the fifth day after much struggle of trying to shift the rock, he resorts to cutting his arm off to get free. The knife on the multi tool he has is anything but sharp and would never cut through his bone so he breaks his arm in two places before he begins cutting. I think this movie was really, very well done, i give a hand to the director, the camera angles and the structure of the movie was fabulous and very well thought out and put together. All i can say about James Franco, is Oscar. Because he truly deserves on for this movie, his acting was exceptional and very believable. I rate this movie 4 and a half stars out of 5.